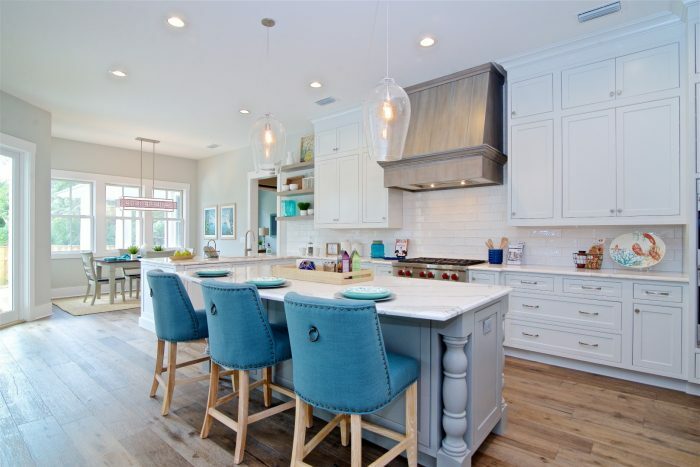 If you’re purchasing a new custom home in Ponte Vedra Beach from Glenn Layton Homes and want to make the most of coastal living with the decor in your home, there are plenty of classic design ideas to incorporate. From bright and bold, to a serene oasis of relaxation, you’ll find a wealth of design options to incorporate into your perfectly built home. After all, if you’re moving into the EvenTide community, you’ll be living in an estate-size home located between the Atlantic Ocean and the Guana River, with private beach access. What better place to incorporate the best of coastal design. Where else can you get away with bright colors inside and outside your home! The coast, with its wealth of sunshine and happy vibes is perfect for bright coral colors, sunshine yellows, sky blues, and verdant greens. Even if you prefer to keep your home’s exterior more neutral, consider going bold with the front doors and don’t forget to paint the ceiling of your porches a sky blue. Inside, you can fill your home with vivid colors or choose a select few colors to bring life to the room, such as yellow bedspreads in an otherwise white bedroom, or a coral rug in an earth-toned living room. You can still use color in your home without it being bold. Use light or dark shades of typical coastal colors such as blue, green, white, and sand. Whatever color palette you choose, aim to keep the rooms feeling bright and full of natural light. Of course, not every room needs to be filled with color. For a more relaxed vibe, aim to capture the bright airy feel of the coast and use neutral tones. The key to avoid a flat feeling is to layer different neutrals. Sheer white curtains against pale sand-colored walls, with a jute rug and warm wood tones in the furniture, with perhaps a few decorative bowls in pale blue and sand tones bring the beach indoors in a relaxed but elegant style. Just as coastal homes benefit from using colors that call to mind the outdoors, don’t forget to use other natural elements of the outdoors inside. For example, natural fibers such as seagrass, jute, and sisal are ideal for everything from chairs to rugs. For simple but stylish decorations, choose a few statement palm fronds or banana leaves in rich shades of green. While it may be tempting to fill each room with shells, bamboo, and fishing or boating paraphernalia, it’s best to scale back your collection. Choose a beautiful coastal scene for a statement painting over the sofa or have just one or two elements in a room, such as a ship’s lantern on a mantel or a collection of shells in a woven bowl or glass jar. Use carefully chosen pieces, rather than overwhelming the room and moving into kitsch territory. Finally, thanks to the way that Glenn Layton Homes designs each floor plan, your home will offer plenty of ways to create a natural flow between the indoors and the outdoors. Just as you bring colors and materials of the outside into your home, consider turning your outdoor porches and balconies into outdoor living areas. For example, choose comfortable and stylish furnishings for outdoors and incorporate indoor elements such as rugs, art, and even curtains. They can help define areas while also offering true comfort so that you feel just as good indoors or out. You could even take it a step further and consider creating outdoor sleeping areas. Whether you choose hammocks or an actual hanging bed on a balcony or porch, you may find that sleeping outdoors isn’t just for camping trips. With a new custom home in Ponte Vedra Beach built by Glenn Layton Homes, you’ll have the coastal world at your fingertips. By building this home in EvenTide, you guarantee that you’ll be in the most desirable coastal location in a unique and inviting community.